If you haven't already (heck, even if you have, it's worth seeing again!) please enjoy this flash mob performance of the Hallelujah Chorus from Handel's Messiah. The African violet is still going strong, with lots more blooms than last month. Another one or two might end up coming home from the grocery store over the winter, if I can find another couple of sunny spots to put them. I've fallen in love with African violets all over again. The last time I had one, I was still a kid. Down in the basement, there's a bunch of stuff overwintering under our big grow light. Some of it's blooming again already, even though everything was cut back hard before coming inside a few weeks ago. It's hard to believe this fuchsia is 'Blackie.' Under the big light in the basement, we still get blooms, but they're much paler than they are when the plants are outdoors. Fingers are crossed on the fuchsia. I've killed one over the winter each of the last two years. Here's a close-up of a red dragonwing begonia - another example of pale basement blooms. Outdoors this begonia's blooms are truly red. Also blooming in the basement are purple-leaf oxalis, pink dragonwings, a peach-colored geranium, and a bunch of Diamond Frost euphorbias. It's 9 degrees outdoors as I write this, and the garden is covered in a blanket of snow. Winter is settling in here in Chicago's south suburbs. The kids and grandkids are healthy, the freezer and pantry are stocked, Christmas decorations are up, and the Middle girl and her fiance' arrive from tropical Florida this weekend. All's well in my world, as I hope it is in yours too. For more Bloom Day posts, please visit Carol at May Dreams Gardens. This is a colorful, elegant salad that's a pleasure serving with love and a toast to good health, made from one of the most nutrient-dense vegetables available. One cup of this delicious salad provides 1,300% DV vitamin K, 200% DV vitamin A, 88% DV vitamin C, and many other nutrients including protein, minerals like manganese, magnesium, calcium, and copper, antioxidants like Superoxide Dismutase, sulforaphane, lutein, kaempferol, and quercetin, and other phytonutrients including at least 45 different flavonoids. *Use as many organic ingredients as possible. Feel free to substitute your choice of herbs. "Massage" the shredded kale leaves with clean hands. This helps tenderize it and develop sulforaphane. Combine kale, shredded carrots, and diced pepper. Whisk together lemon juice, olive oil, garlic, herbs, salt, pepper. For an extra kick, add a pinch (or more to taste) of hot red pepper flakes. Add 2/3 of the cheese and toss again. Garnish with the rest of the cheese. This salad should be prepared at least a few hours in advance, and keeps well for a couple of days covered in the refrigerator. Many raw fruits and veggies are difficult for me to eat due to my digestive disease. When I first tried kale, both raw and cooked, it didn't seem to be a vegetable I could tolerate. Advance preparation of this salad though, combined with lemon and raw cider vinegar, not only helps develop the sulforaphane, it also tenderizes the kale, making it easily digestible even for someone like me with a very sensitive digestive system. 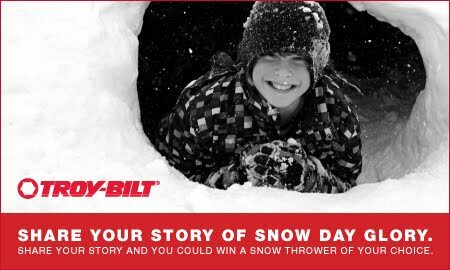 Snow-Day Memories and a Snow Thrower Giveaway! The stricken metropolis lay gasping, barely able to move. The storm swatted it, slugged it, smashed it, crushed it in 75 million tons of snow. But in the end the metropolis did not break. Like a dazed giant, it shuddered under the monstrous weight and began stumbling to its knees . . . then regained its feet . . .
Tens of thousands of Chicagoans fought the storm, from the first. They met the superstorm and the storm could not break the city. So, remember: It snows in Chicago. It gets cold in Chicago. And we do not break. ~ M. W. Newman, from the now-defunct Chicago Daily News. And so it was on Thursday and Friday, January 26th and 27th, 1967. For a nine-year-old girl, those were exciting, wonderful, memorable days. Beautiful muted light came through snow-covered windows as a hearty, homemade stew bubbled in the kitchen. Outside, impromptu snowball fights broke out. Snowmen, snow forts, and snow angels were created. In homes throughout the city, little jackets, mittens, and scarves were draped over radiators to dry while rosy-cheeked girls and boys sat at kitchen tables sipping sweet, steamy Ovaltine. Mom remembers our street didn't get plowed for a long time. (I know, hard to believe this could actually happen in Chicago. ;) She recounts, "Residents with snow shovels (who had snow blowers in those days?) got together and shoveled out streets and alleyways. In our neighborhood, the only way into your garage was through the alley. Garbage trucks went down alleys to pick up garbage. There was no garbage pickup until you got your alley shoveled out yourselves, so garbage was piling up and adding to the blockage. I remember Dad and a couple of others shoveling out that whole alley. Out on the street, cars were buried over their tops in snow. When you tried to shovel out, there was no place to put the snow. There were lots of unhappy people who, when they finally shoveled their cars out, came home to find that the snow from someone else's car had been dumped in their spot. It took many, many days to clear out." We don't remember for sure how long school was closed. It was a long time though, maybe even as long as two weeks. Normal life in the city was disrupted for a long time. Even putting food on the table was challenging for many families in the aftermath of the storm. Mom says, "Stores ran out of groceries because delivery trucks couldn't get through. I don't remember how long it was before we could get to the store, but it was quite a while. I think the cupboard was getting a little sparse. We ran out of milk and some other staples. We didn't know how long the supply of toilet paper would last - I think we finally had to use kleenex for a couple of days." I remember running out of milk too. I remember them talking about the milk shortage on the 6:00 news. It was a big problem. We needed it for our Ovaltine! 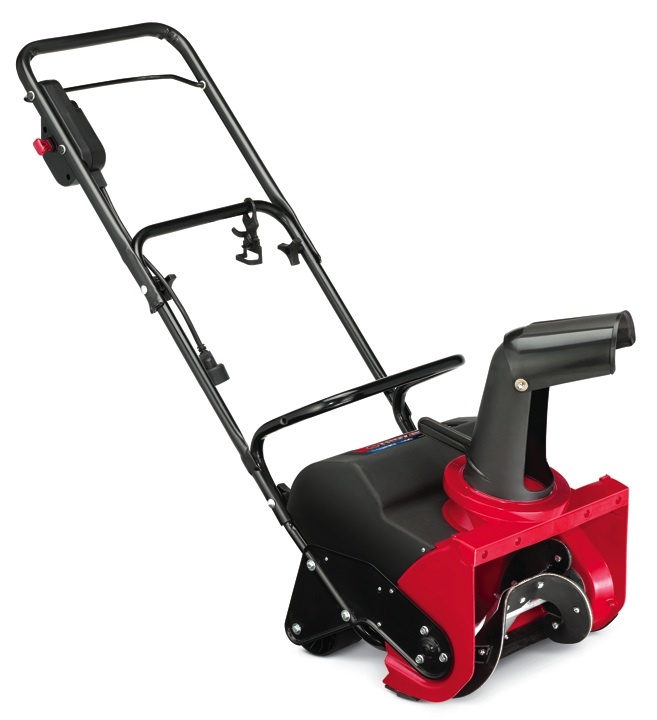 The compact Flurry 1400 is ideal for milder winters, smaller driveways and lighter snowfalls. Designed with features that make it easy to operate, including a dependable push button electric start. The Storm 3090 XP 2-stage snow thrower features a wide 30" clearing width, Touch 'n Turn power steering and heated hand grips, plus an in-dash headlight and reflective strips for greater visibility in low light. Contest Details: Snow thrower giveaway is sponsored by Troy-Bilt, and is open to US residents only. Winner will pick between the 3090XP and the Flurry, depending on where they live and snowfall. (Troy-Bilt can provide assistance to winner in making their selection if unsure.) Contest ends at midnight, CST December 3, 2010, and winner will be selected using Random.org. FTC Disclosure: As host of this giveaway, I will be receiving a complimentary snow thrower, and will review it in a later post. 12/4/10 Update: As I write this, we are in the middle of our first snow storm of the season, with about 2 1/2-3 inches on the ground already this morning. Our new snow thrower has arrived and been uncrated, ready to go to work later today. Congratulations Ramble On Rose!!! You are our winner, and you'll get to pick which snowblower is best for your family's needs. I'm very excited for you! While we still have a few late bloomers in the garden, this is my favorite bloom this month. I haven't had an African violet since I was a kid. This one was picked up at the grocery store a few months ago. This is the first time it's rebloomed. Looking at it makes me feel nostalgic, reminding me of being a little girl, doing my first plant propagation experiments with African violet leaves, spider plant babies, and purple passion cuttings. In the garden, mums are still looking pretty good. Although we had our first hard frost of the season earlier this month, Rozanne geraniums haven't quite called it quits yet. Also blooming in our mid-November garden are asters, calamint, hardy cyclamen, and a late-blooming cimicifuga. We even have a hosta and a foxglove (Digitalis grandiflora) that decided to rebloom this month. Both are much less showy than their first blooms, but they're blooming nonetheless. Chicago's warm, sunny fall is yielding to November's typical cloudiness and chill. I used to hate this time of year. Something's changed in me though in recent years, and I now welcome it, and winter too. Life is beautiful in all its seasons. Happy November Bloom Day. For more Garden Bloggers' Bloom Day posts, please visit Carol at May Dreams Gardens. Even if the sound of it is something quite atrocious. Kale is rich in antioxidant, anti-inflammatory, and anti-cancer nutrients. For example, Superoxide Dismutase (SOD,) is an important phytonutrient, an antioxidant abundantly present in kale. Kale is an all-around nutritional powerhouse; rich in calcium, iron, magnesium, manganese, lutein, beta-carotene, omega-3 (ALA,) at least 45 different antioxidant flavonoids, fiber, and vitamins A, C, and K. It's a sulfur-rich vegetable, which in part accounts for its reputation as a detoxifying, medicinal superfood. Sulforaphane is formed when sulfur-rich cruciferous vegetables such as kale are chopped and chewed. Sulforaphane triggers the liver's production of detoxifying enzymes, helping the body cleanse itself of some of the dangerous environmental and ingested toxins we're exposed to in this chemical age. We're growing kale in our garden for the first time. I didn't know much about it when it was planted, only that it looked cool, and would be one of the hardiest vegetables I'd ever grown. While this might be the first time kale has grown here, it won't be the last now that I know what a fantastic food it is. And, while most of the veggies are now toast following a killing frost last week, our kale is still beautiful and delicious. We can expect to still be harvesting it for weeks to come, even here in our zone 5 garden. In fact, like brussels sprouts, the flavor of kale improves and becomes even sweeter with the frost and typically chilly weather of November in Chicago. There are many delicious ways to enjoy kale, either raw or cooked. It can even be a beneficial addition to a beloved pet's diet. George enjoys it immensely. He eats his kale raw, finely chopped and mixed in with his homemade, whole-foods diet. Kale is one of a variety of nutritious vegetables recommended by George's new holistic veterinarian. It's so rewarding knowing I'm growing some of the food that is nourishing him through his remarkable recovery from a number of geriatric health challenges. Back in September, when I met up with Monica, Diane, Rose, and Beckie at Chicago Botanic Garden, we saw Redbor kale not only in the vegetable gardens, but also in ornamental plantings throughout the gardens. As you can see in the photo, it is really beautiful. For ornamental gardeners who don't have dedicated vegetable growing space, consider adding kale to your ornamental beds for its beauty, and be sure to harvest some for your kitchen for your own inner beauty and good health! Update 11/5/10 - Francis Thicke ran for Agriculture Secretary of Iowa. He was the only candidate for statewide office in the entire country running on a sustainability platform. Running against a candidate whose campaign was largely supported by Big Ag, he unfortunately wasn't able to garner enough votes to win the office - a loss for Iowa, and a loss for the entire country. My fervent hope was that he would win. Our country is sorely in need of environmental consciousness among our elected officials. Although Mr. Thicke didn't win this election, he had broad-based support in Iowa and added a great deal to the very important conversation in the US regarding the need to return to sustainable agriculture. Small family farms have taken a beating in recent decades in this country. Government subsidies have contributed in large part to the growth of industrial-scale farming and contributed to the decline of family farms. With the explosive growth of farmers markets in recent years and a small percentage of consumers demanding and seeking out safe, healthful food for their families, organic, sustainable farming methods are on the rise. While the end of October also signaled the end of farmers markets for this year in our area, I encourage everyone who hasn't yet to investigate how your food is being grown. If you haven't, and if you're purchasing conventionally-grown, factory-farmed meat, eggs, dairy, and produce, you might be quite shocked at the conditions your food is being grown in and shocked at the hormones, antibiotics, pesticides, and other chemicals on your dinner plate. If you haven't already, watching the documentary film Food Inc. is a good place to start. It's no wonder the health of our nation has declined so dramatically in recent decades. The rise in degenerative disease in this country is shocking. Big Ag is poisoning our food, water, and air, and Big Pharma is continuously coming up with new, and often more dangerous drugs to treat the diseases our adulterated diets (not to mention our chemical-laden soaps, shampoos, toothpastes, deodorants, cosmetics, and cleaning supplies) are triggering. Events in my own life in recent years, including developing a chronic, inflamatory autoimmune digestive disease several years ago, returning to my vegetable gardening roots in the last couple of years, and nurturing my ten-year-old puppy George back to good health through a radical change in his diet have been eye-opening experiences. You may be wondering why I'm talking about this. This is a garden blog after all. Aren't I supposed to be talking about pretty flowers and beautiful tomatoes? Although I was told several years ago when I was handed the diagnosis of my condition that it was treatable (with drugs,) but not curable, I'm now on a mission to prove the doctors wrong. Heartened by witnessing seeing my beloved companion George healing from his chronic, supposedly incurable health conditions through dietary changes, I'm resolved to get the toxins out of my own diet, and out of my environment as much as I can. If changing from a commercially-prepared diet to a healthy, pure, whole-foods diet works for an elderly dog, it can work for humans too. I'm on a mission to prove that for myself, and will be sharing my journey with you in the hope that it may be of some value to you too. If it makes a difference in the life of just one person, or even one pet, it will be worth the effort. Last year I began participation in Native Seed Gardeners, an organization that uses home-gardener-volunteers to grow native plants. The purpose is seed collection and use of the seeds in restoration of conservation lands. We're growing purple milkweed, cream baptisia, and Canada hawkweed for the project. Just this morning I mailed this year's seed harvest - a packet of hawkweed seeds. So far only the hawkweed has bloomed. Purple milkweed (Asclepias purpurascens,) is little, but still has big fall color. Canada hawkweed (Hieracium canadense,) bloomed its first season, and bloomed off and on again this year from late June through September. 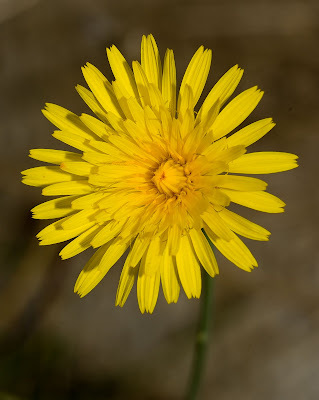 I'm sure I must have a few, but since I couldn't locate any photos of the hawkweed in bloom, here's what it looks like now. Canada Hawkweed is in the aster family. It looks like a tall dandelion, and can be anywhere from about two to five feet tall. This year It grew to almost three feet, and bloomed well in a spot that gets about three hours of filtered sunlight a day. It's a sunny, cheerful bloom. It's not a plant I would have thought to add to the garden if not for participating in the Seed Gardeners project. While it's not my favorite native in our garden, I'm happy to grow it for the Seed Gardeners project. It's a good feeling, knowing the seeds help restore native habitat in our area. For more Wildflower posts, please visit Gail at Clay and Limestone; lover of native plants, garden blogger extraordinaire, and our host for Wildflower Wednesday. Knowlege is power. We can make a difference by educating ourselves and voting every day with our wallets. Together we can push to the tipping point what may be one of the most pressing health issues of our time. For the health of our children and their children, if you haven't already, please educate yourself and share your knowledge with family and friends. For more information please visit The Institute for Responsible Technology. Here in zone 5a, our first average frost date is October 15. The last two years we haven't had frost until mid-November. Although we're on borrowed time and the weather has taken a chillier turn, there's been no frost yet. The hardy cyclamen is still blooming, and its foliage is up now too. Aren't they pretty! We have good luck with mums coming back year after year if we plant them in spring. These were added in spring 2009. This year they were pinched in May and July. A few new ones were started by sticking a few of May's cuttings in the ground. Six cuttings rooted, and they're blooming now too. Pansies are quintessential cool-weather blooms. We're enjoying their sunny faces. Here's another mum planted in spring last year. This one flopped as mums are prone to doing, in spite of being pinched in May and July. The blooms are still welcome even if the plant isn't perfectly shaped. This year, Liquid Fence is doing a good job keeping the blooms coming. Last year the bunnies ate them as quickly as they opened. Love 'em or hate 'em, mums add color to the garden at a most welcome time of year. They're easy-care, easy to start from cuttings, drought-tolerant, and bloom well in full or part sun. Ours get less than three hours of sun a day and still bloom beautifully. Here's another pansy just opening up. The nasties seem to like the cooler weather. They still aren't blooming very prolifically, but look - two blooms at once! I've given up on removing the yellow foliage. The tropical hibiscus has a lot of buds, and this one opened just in time for Bloom Day. It's been about two weeks since we've seen a hummingbird. The fuchsia helped attract them all season. Fuchsias have been challenging to overwinter, but I'll try again this year. I think I tend to over-water them after they come indoors. They like moist soil, but not too moist. Last but not least are this month's most magnificent blooms. The patio smells like heaven. Last year the angel's trumpet didn't bloom at all. This year it was moved around until a spot on the patio was found where it got almost full sun. This is the second time it bloomed since finding this spot. The first time it had seven or eight blooms. This time it has thirty - more blooms than ever. In the past two weeks as the sun drops lower in the sky, it's getting just a little sun in the morning, but it's ok. The buds were formed while it was still getting lots of sun, and it will soon be coming indoors for the winter. There are still lots of annuals blooming here, along with 'Autumn Joy' and 'Matrona' sedums, 'Happy Returns' daylilies, calamint, 'Rozanne' geraniums, 'Autumn Bride' heuchera, and a few sporadic phlox, coneflower, aster, and rudbeckia blooms. To see more October blooms in gardens across the country and around the world, please visit our gracious Bloom Day host, Carol at May Dreams Gardens. Just before Christmas, George will turn ten years old. He's definitely not a puppy anymore. In the last three years he's developed some health challenges, including hypothyroidism, unhealthy weight gain, and chronic staph skin infections. His hip dysplasia and arthritis have worsened. He walks with a pronounced limp, gets up and down from a reclining position, and on stairs with difficulty. He's shortened his stride with his back left leg, and had developed considerable swelling and atrophy in his left hip. I've done a lot of research on geriatric pet health in recent months, and was pretty mortified about what I learned about most commercial pet foods. In an effort to improve his quality of life for however much time he has left with us, George recently visited a holistic veterinarian. We're in the process of transitioning his diet from commercial dry kibble to a homemade grain-free and raw diet. He's now enjoying a smorgasbord of homemade lightly-steamed turkey, dark green vegetables, sweet potatoes, raw eggs, water-packed sardines, wild salmon, fish oil, (raw, organic, unrefined) extra-virgin coconut oil, glucosamine and chondroitin, a high-quality prepared commercial raw dog food, and a blend of Chinese herbs targeted to improve the condition of his liver, joints, and skin. This year we grew dinosaur kale in the garden. Early in the season I realized it didn't agree with me, so I've just been letting it grow, enjoying it's wonderfully crinkly blue-green leaves. Since starting to grow veggies here two years ago, George has enjoyed keeping me company while I work in the beds, especially when I'm picking peas and green beans - two of the veggies, along with kale, that his new vet has recommended. He's been enjoying peas and green beans in season, picked fresh and served immediately. Little did I know when I planted all this kale that I wouldn't be able to eat it, but that it would help George get healthier. In three short weeks since beginning to modify his diet, George's skin infection is gone, his fur is growing back, his coat is shinier, he has more energy, he's taking longer strides, his hip swelling has gone down considerably, he's even enjoying exercise again, and he's losing his excess weight. He's a lab mix, and being a retriever, he's always loved chasing sticks, balls, frisbees, and his stuffed toys. We haven't been able to play with him like that in the last couple of years - he would get too sore and stiff. In just the last week or so, he's back to running around, chasing his toys, and enjoying a whole new, more active, less painful, and more fun life. He gets up and down more easily, and seems to be on his way to much healthier days ahead. We're looking forward to a better quality of life for however long he has left, maybe even a longer life than he might have had if we'd continued his old diet, and hopefully much lower vet bills than he's had the last couple of years. It never occurred to me when starting the veggie beds that George would also benefit from our fresh, organic produce, or that the kale I planted this spring that seemed as if it might go to waste, would become part of what was needed for improving our sweet doggie's health and quality of life. About this time last year, during the annual autumn visit to Mom's; something, probably rabbits, wreaked havoc. Decimated is not too strong a word. A fresh dose of smelly stuff will be applied here before leaving tomorrow for this year's fall visit. Just in case, this is what the shade garden looks like. Our garden has taken a long time to establish. I haven't always been patient. Year Seven has been the best yet. It feels like a garden to me for the first time. I hope it's still here when I get back. Last year when the asters looked about like this, something ate them down to the ground (along with about a third of the rest of our shade garden, while I was away visiting Mom.) This year the asters and other most vulnerable plants are fenced, and Liquid Fence, that lovely smelly stuff, has been applied after recently discovering one of our Japanese forest grasses had been grazed on. This one is commonly known as small white aster. It may be Symphyotrichum lateriflorum. One volunteer was found at the edge of the lawn under a blackhaw viburnum last year. It was rescued from the lawn mower and added to the shade garden. One was a blogalong passalong from Gail. I love their puffy cloud of blooms, gracefully-curved stems, and carefree nature. Three smooth blue asters were added last year too. The bluish leaves play nicely with the other foliage colors here, and I love their sweet blue blooms. Asters and other late-blooming native plants like goldenrod make wonderful additions to gardens, blooming at a time of year when flowers are generally less plentiful, adding color to the garden and providing valuable food for pollinators. Wildflower Wednesday is the bloggers' celebration of native wildflowers begun by our dear Gail at Clay and Limestone, and held on the fourth Wednesday of each month. Please visit her blog for links to more Wildflower Wednesday posts. September is one of my favorite months in general, and in the garden. The hardy cyclamen likes September too. This is the second one to bloom. The third bulb is MIA. The 'Spring Fling' petunia has been cut back hard at least three times this summer. In its second year, it has grown to gargantuan proportions, especially considering it only gets three hours of sun each day at most. Maybe I'll overwinter it again to see what happens. Helenium, a/k/a sneezeweed is a native started from seed this spring from Monica's seed swap. It's growing happily in the swale way in back. The first formerly-known-as-aster to bloom is this teeny tiny one from Gail. When it really gets going it'll be a cloud of beautiful airiness. Late last September, during a visit to Mom's, all the asters, and many other plants were chewed to ground by something, I think rabbits. These are August blooms, too late for August Bloom Day. We found a sweet spot on the patio where the brug gets lots of sun. I love the foliage of the variegated brugs, but still was determined to find a spot where ours would bloom more than once a season. In its new spot since mid-August, it bloomed for the first time this year in late August, and already has its next set of buds. Love double impatiens in hanging baskets! This color is salsa. We've been eating a lot of salsa lately with all the beautiful tomatoes growing in the veggie beds. Calamint is still going strong. I'm not sure who loves them more - the bees or me. 'Blue Hill' Salvia is blooming even more prolifically than last month. Not many coneflowers left - the goldfinches have pulled off most of the petals. Only a few on the other side of the garden escaped their notice. as have the agastaches. Strong winds early this month pretty much flattened them though. Normally they stand nice and tall. Hummingbirds visit the hanging fuchsia several times a day. I love the soft color of Sedum 'Matrona.' Last year they didn't flop, this year they did. They're pretty anyway. More double impatiens - I like them with 'Diamond Frost' euphorbia - like roses and baby's breath for shade. Pink Dragon Wing begonias bloom non-stop spring to frost, and are easily overwintered indoors. We have the reds too. Ever notice how foliage colors are slightly different with different colors of the same plant? The reds have ever-so-slightly darker foliage. The double impatiens are like that too. We have the nicest farmers' market in a neighboring town. This bouquet came from the booth of neighborhood organic backyard kitchen gardeners. They sell home-grown veggies, herbs, and cut flowers, and hand-crafted organic homemade teas, soaps, lotions, lip balms, even insect repellent and dog shampoo, and more. I try to visit the market early, before the kitchen gardeners' flowers, and the farmer's eggs in another booth sell out. Our own town's farmers' market is nice too, while much smaller. I shop at both as often as I can. We still have pink and white phlox, 'Happy Returns' daylilies, sambac jasmine, 'Rozanne' geraniums, all sorts of heucheras, lots of single impatiens and wax begonias, purple oxalis, Susans, and a few other odds 'n ends. Last but not least, Japanese anemones, almost forgotten a second time. They're blooming for the first time ever. They've been blooming since early August. Our second attempt at these, I thought our garden might be too dry for them since the first ones withered and died their first summer. These started life here as tiny transplants from a client's garden, and haven't seemed to mind the dry shade. They took three years to bloom, and were worth the wait. I hope you're enjoying the cooler weather of September. Here it's been a welcome relief after a very hot summer. I won't say long hot summer though - time seems to go by far too fast anymore, no matter what the weather. Garden Blogger's Bloom Day is celebrated on the 15th of each month by bloggers around the world. To see what's blooming right now in gardens everywhere, please visit Carol at May Dreams Gardens. Happy Bloom Day!